If the recent history of the Middle East is any indicator, the sweet cream of victory will eventually sour. And the victors of the Nagorno-Karabakh war, alienated from their neighbors, with whom they are condemned to live, may turn out to be the real victims themselves. The following is an edited transcript of the 10th Year Khojali Massacre Commemoration presentation delivered by writer Thomas Goltz at the London School of Economics on February 26, 2002. This event was organized by the [Azerbaijani] Vatan Society of the United Kingdom. Mr. Goltz delivered a shorter version of these remarks on February 21 at a similar commemoration organized by the Azerbaijan Society of America (ASA) at the Cannon House Office Building in Washington, D.C. I have been asked, and thus honored, by friends both inside and outside the government of Azerbaijan to help mark the 10th year commemoration of the Massacre at Khojali on February 26th, 1992. I feel humbled to have been asked to do so. Left: A close-up of the Karabakh region. I want to preempt any speculation or misunderstanding and from the beginning state that I have not been paid to make this speech. I wish to stress this because I have seen too many references on the Internet and elsewhere about my being some sort of paid lackey of the government of Azerbaijan and/or Big Oil. Thus let us be clear: I am NOT now a lobbyist for Azerbaijan or any oil interests, never have been, nor have I ever received a dime from either the government of Azerbaijan or any oil or other company for any appearances or public presentations on any issue relating to Azerbaijan. And yet, there is no question that I feel very strongly about Azerbaijan. Perhaps one of the most important reasons for this is my experience of the events surrounding the Khojali Massacre of 10 years ago. Today, few people outside Azerbaijan and, arguably, Armenia, are really interested in Khojali. 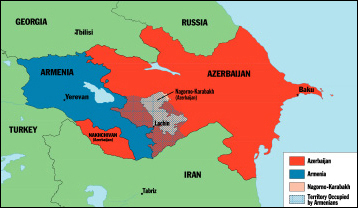 Left: The cross-hatched area of the map shows the Azerbaijani territory currently being occupied by Armenia; note that seven of the regions occupied are not even in Karabakh. Why should they be? In a decade that subsequently saw the vast ethnic cleansings of Bosnia, Croatia, Kosovo, East Timor and Chechnya, as well as the slaughterhouse of Rwanda - to name just a few of the killing zones of the pre-September 11  - World Trade Center bombing "Age of Innocence" - the 800 odd victims of Khojali are "but a drop in the bloody bucket" of ethnic/national and religious insanity that is the birthmark of the so-called post-Communist world. Even within the context of Azerbaijan, the numbers killed and displaced as refugees from Khojali are but a fraction of those eventually killed or displaced in the course of the war over Mountainous [Nagorno] Karabakh. Depending on which, or on whose, abacus you choose to tally, the total number killed is around 30,000. Those displaced because of the war are approximately 1 million, before the cease-fire was established in 1994, which left Armenia occupying some 15 percent of Azerbaijan's territory. Everybody, or at least the victim, always tries to push them higher. I say this because the official percentage of Azerbaijani territory under Armenia occupation is 20 percent. This number sounds good because it can be expressed as "one-fifth," even though it is a provably inaccurate and politicized number. The Armenians occupy 15 percent, not 20. 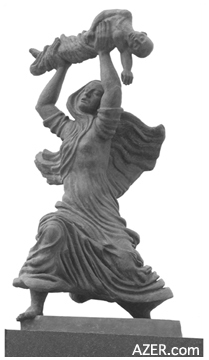 Right: A statue of a mother and her child, commemorating the memory of the hundreds of victims who died in the massacre in Khojali. The monument in Baku reads: "Scream of the Motherland: In memory of the martyrs of the Khojali massacre." Photo: Elman Gurbanov. I tell my friends in the government of Azerbaijan that it would behoove them not to get in the habit of exaggeration. On the other hand, Armenian apologists suggest that because "independent" Karabakh cannot "occupy" itself, the real number of square kilometers under Armenian occupation is less than 10 percent of territorial Azerbaijan. Ten percent, as opposed to 20. Let me say right now that this is a ridiculous argument, and one along the lines of a girl admitting to her parents that she is "a little bit pregnant". Either you are or you are not-pregnant, that is. And either you are occupying Azerbaijani lands, or you are not. It doesn't make any difference if it's five percent or 50 percent. 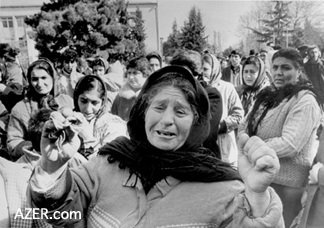 Left: Woman in Aghdam grieving for loved ones massacred in the night raid on the Azerbaijani town of Khojali. February 1992. Photo: Azertaj.And, as for the familiar dodge that it is not Armenia, but an "out-of-control" Karabakh that occupies the Azerbaijani lands, well, one need only look as far as the citizenship of the current President of Armenia to dismiss this argument [Robert Kocharian is from Karabakh, which is officially Azerbaijani territory]. Unless, of course, you want to make the argument that Karabakh not only occupies a good chunk of Azerbaijan, but all of Armenia itself! But back to Khojali and February 26th, 1992. There has never been a proper reconstruction of what actually happened that night. One might ask if any reconstruction is really possible, given the lack or absence of an Armenian equivalent of Russian human rights crusader Sergei Kovalyov or an organization like Memorial, which has courageously addressed the issue of atrocities for a similar massacre in the Chechen town of Samashki in 1995. We do not have time to go into this in depth now, but suffice it to say that this book, entitled "By All Available Means", is an effort to get at the facts about the Samashki Massacre and publish them not only for Russian consumption, but for the world's. It is precisely the sort of insider investigation needed to get to the bottom of the Khojali Massacre, and precisely the sort of undertaking that is lacking because the Armenian side does not dare do so. Does not dare do so. Still, there are problems with reconstructing violent histories. While I have the greatest respect for Memorial and its efforts to meticulously research and publish its findings, its publication on Samashki is not perfect. There are errors of time and person and place. Without elaborating, suffice it to say that while Memorial accepts that the Russian command used the presence of outlander Chechen fighters from Shamil Basayev's Abkhazia Battalion attacking an armored train and sabotaging repair of tracks as the excuse to encircle and then attack the town, in fact all those fighters were local. I know because I was with them taking pictures. Memorial was not. They were not nameless Mujaheeds-they were Hussein and Ussam and Seylah and Sultan and Ali. I hope you get my point: even the most meticulous reconstruction of a violent event runs into problems if you were not there. And even then, it often becomes problematic. The problems with properly reconstructing events in Khojali are far more complex than those of Samashki in Chechnya. For starters, there was the initial denial on both the Armenian and Azerbaijani sides that anything untoward had happened at all. I refer, of course, to the infamous statements of the government in Baku of Ayaz Mutallibov, that everything was "normalno", (Russian for normal) in Karabakh during the period in question, as well as the standard Armenian denials of any and all involvement in the killing-a denial followed by the outrageous suggestion that the massacre was perpetrated by the Azerbaijanis themselves. Yes! In some circles, the accepted "truth" about Khojali is exactly that. Although the differences in the order of magnitude are huge, this persistent "self-slaughtering" argument is akin to such grand conspiracy theories as the all-too-popular belief circulating throughout much of the Muslim world that the attacks on the World Trade Center [September 11, 2001] and Pentagon were perpetrated by the Americans themselves in order to create a reason to take up arms against an innocent Osama bin Laden. If you want to drift into large conspiracy theories that defy logic, you're welcome! But I prefer to stay based in reality. So, what really happened that night of February 25/26th, 1992, and why? My own findings at the time, coupled with subsequent discussion and research - I would like to note, with leading Armenian academics and others who had contacts on the Armenian side (but with whom I have not had direct contact for reasons of personal safety)-suggest the following. 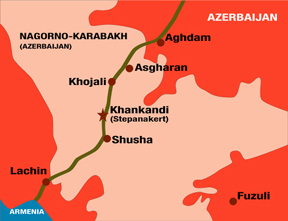 Perhaps motivated by the anniversary of the so-called "Sumgayit pogroms", and certainly in keeping with the pattern of flushing all traces of Azerbaijaniness from Karabakh, Armenian fedayeen units succeeded in surrounding Khojali and issued an ultimatum that included a provision of "safe passage" for the population through a corridor. But this is where things get murky or fall into bitter dispute. Was there an all-out, armored attack on the town, spearheaded by the 366th Russian motorized infantry brigade, allegedly in Karabakh to secure the peace? Survivors and eyewitnesses ranging from distraught civilians to several Turkmen conscripts that I interviewed in Aghdam after they deserted the 366th insist it was so. The most rational Armenian version of events, recorded by folks I trust and that does not necessarily contradict the blitz story, suggests that either prior to the evacuation, or during the course of it, shots were fired that resulted in the death of certain Armenian commanders. Their units, without a great deal of discipline in the best of times, went berserk - and the slaughter began. The one version that can be dismissed out of hand is the so-called "self-slaughter" of Azerbaijani citizens by Azerbaijani militia forces, allegedly lurking in ambush in no-man's land in order to discredit the government in Baku and cause a revolution to unseat the Mutallibov regime. This version, so often repeated by the Armenian side to exculpate itself and throw the onus of killing hundreds of civilians by "friendly fire", is always sourced back to Ayaz Mutallibov after he was ousted from power in the Spring of 1992. But now even Mutallibov himself has repudiated this version of events. In a BBC interview last night [February 25, 2002], the last Communist Party boss of Soviet Azerbaijan specifically blamed the Khojali massacre on Moscow's inability to keep the peace, weirdly absolving himself by asking the rhetorical question of whether George W. Bush was responsible for the attacks on the World Trade Center and Pentagon. I was allowed to publicly comment on Mutallibov's remarks, and so I guess he should in fairness be allowed to publicly comment on mine about his - and I am ready to respond should he chose to do so. Should he want to, my point is simply this: if there is culpability on the Azerbaijani side for failing to protect Khojali, it rests with Ayaz Mutallibov for believing too much in the power of the Center - distant Moscow - to resolve the problem. And from his pre-recorded remarks, I think we are in essential agreement. It was his incompetence, and not some deep-dark conspiracy hatched by the Popular Front or other forces, that resulted in that night of horror. Call it a plot, or call it denial of involvement - it ultimately makes no difference. Khojali established the pattern for all future disinformation from the Armenian side throughout the remainder of the Karabakh conflict. In May, three months later, there would be the conquest of Shusha [the town most closely identified with Karabakh because of its deep Azerbaijani cultural roots]. Once again the attack came, just as it had with Khojali, during a time when high-level peace negotiations were being mediated by Iran. Azerbaijani forces were said to be "attacking" Stepanakert [the administrative center of the Nagorno-Karabakh district, which the Azerbaijanis historically refer to as Khankandi - place of the Khan]. By then, Shusha was an "enclave" within an "enclave", to use all the wrong and politically loaded expressions. And the idea of launching an "attack" at that point in the conflict was, quite frankly, insane. But the propaganda line stuck - and the Armenian defenders were able to defend themselves very nicely - by conquering Shusha. Next there was Lachin [a small Azerbaijani town between Karabakh and Armenia], attacked under the guise of assisting local Kurds in "revolt". Strange that the Kurds in question ended up fleeing to Baku, while the "local Kurds" encountered and interviewed by international observers were sent to the region from Yerevan and all seemed to be Yezidi Kurds, meaning that they had come from Armenia itself. Using the Kurdish issue to confuse the international community was an excellent stratagem and the brainchild of a senior member of Levon Ter-Petrossian's inner circle, who detailed it for me after we had learned to trust each other for the sake of piecing together a complete history. It was clever because it was built upon the familiar cliché that Azerbaijanis are "Turks" and thus hate "Kurds" and vice versa, as is believed to be the case in Turkey by many in the West. I shall not enter that debate now, but only wish to note that whatever situation pertains between Turks and Kurds in Turkey, it was not, and is not, the situation that pertains to Kurds and all the other ethnic groups in either Soviet or post-Soviet Azerbaijan, where an entirely different ethnic policy has existed for decades. I repeat. Whatever situation exists in Turkey between Turks and Kurds, good or bad, is not what exists in Azerbaijan between Kurds and all the other ethnic groups in the country. On the most basic level, there are Kurdish newspapers and magazines and associations in Azerbaijan - and have been for years, decades. The idea that Kurds in Azerbaijan would join Armenians in a revolt against Baku is, quite frankly, nonsense-but a nonsense that much of the world apparently was willing to believe when the idea was floated at the time of the fall of Lachin, because the Armenian side was able to capitalize on world (or Western) notions of the clichéd conflict of Turk versus Kurd and Kurd versus Turk. "Well done," I want to say - but my heart won't let me compliment the successful propagandists and destroyers of homes to that impersonal degree. Similar to Lachin was Kalbajar, where the twin stratagem of announcing a spirited Armenian "defense" of an alleged Azerbaijani "attack" was coupled with the theme of "Kurds in revolt" with splendid results. A confused international community blinked, Armenian forces gained a few extra days and a new flood of Azerbaijani civilians - many of them Azerbaijani Kurds, if you want to identify them as such - were flushed from their homes in an act of gratuitous ethnic cleansing and territorial aggrandizement on the Armenian side. Merely the feisty Karabakh self-defense forces, acting out of the control of Yerevan! And that pattern continued because it was so successful: Gubadli, Fuzuli, Jabrayil, Zangilan and then, what seems the most absurd, Aghdam. In the internal chaos and confusion of that long, nasty summer of 1993, with Surat Husseinov marching on Baku from Ganja, and thus cutting off Aghdam from all support from Baku, the Armenian side once again announced "a major Azerbaijani offensive" coming from besieged Aghdam, and they succeeded in "defending" themselves accordingly, meaning, of course, the conquest and total destruction of Aghdam and the ethnic cleansing of another large chunk of Azerbaijan. It was clever. It was effective. From a military standpoint, I guess, I have nothing but praise for the Armenian side for having pulled it off. If my sarcasm did not read, then let me elaborate on another case of victory and denial, namely, the tragic case of the so-called "Azeri Eight". It was a story that took me eight months to get published in the Washington Post because no one wanted to know about it. No one wanted to believe a familiar pattern about all aspects of the war in Karabakh, thanks to the effective Armenian propaganda. Eight months. Thirty days for every victim. Eight. The eight that I'm referring to were Azerbaijani commandos taken prisoner during the last phases of the Karabakh conflict in 1993-1994. They were captured in Kalbajar - poor souls - and then transferred to a Yerevan prison. One might well ask why Yerevan, if Armenia was allegedly not involved in this war. But no matter. In Yerevan, they became wards of the International Red Cross, with all the rights of visitations, food packages, letters from home and such that are associated with official POW status [Prisoners of War] afforded by the Geneva Conventions. Things went along all right for a month or two, but then the Red Cross became lax about the Eight and skipped their regular visitation date. When they attempted to see the Azerbaijani soldiers a month later, there was a problem. The prisoners were not accessible. The Red Cross became worried and began pursuing the issue. The Armenians finally admitted that all the eight prisoners had died. But how did it happen? At first the Armenian side said the men had been killed when they tried to escape - in other words, they were shot down on the run, as it were. But the forensic evidence did not jive with such a theory. The bodies were examined by a doctor from Physicians For Human Rights, a group normally and ironically associated with the Baroness Cox herself, who is well known for her Armenian sympathies. The doctor, Derrick Ponder, determined that in three instances, the muzzle of the gun had been resting on the skull when the trigger was pulled. In three other instances, the muzzle blast was so close that the effect was virtually the same - in other words, a point blank execution. The remaining two of the Azeri Eight met a slightly different fate, forensically speaking: one was killed by a rifle blast to the chest at point blank range, and the remaining prisoner had his throat slashed - allegedly by himself. Dr. Ponder brought the bodies to Baku as part of a humanitarian exchange. Word at the time was that the Armenians had gutted the bodies and sold the livers and hearts for transplantation purposes - a story widely believed in Baku. Dr. Ponder contradicted this theory, stating flatly and scientifically that organs removed from dead bodies were useless. The more important story seemed lost on the sensation-driven journalists present in the room at the time. The Azeri Eight, said Doctor Ponder, had been executed in "the clearest breach of the Geneva Conventions I have ever seen." Then, after eight months, I got my story about the Azeri Eight published in the Washington Post. Eight Months. And then the Armenians changed their story: instead of the Azeri Eight being killed during an attempt to escape, now they had killed themselves. Suicide. The forensic expert from Physicians For Human Rights insisted that this, while theoretically possible, was highly improbable given the evidence at hand. The men had been executed in prison, in one of the most obvious violations of the Geneva Conventions perpetrated by the Armenian side. But still the Armenian side got away with it - because they had managed to coax a "improbable" from Dr. Ponder instead of an "impossible". And the world thus remained silent. Who among you remembers the Azeri Eight today as examples of violations of the Geneva Conventions about executing - EXECUTING - POWS in Geneva's care? Who, who? Another victory for appropriate public relations by Armenia, you might say - your ignorance, that is. But what are the ultimate gains for Armenians? A sense of revenge fulfilled? Did they gain a new self-image of the conquering Armenian, as opposed to the historic victim? So what is to be done? There has been a cease-fire since May 1994. There have been the interminable discussions of the Minsk Group [the 12 Member Committee of the Organization of Security and Cooperation in Europe (OSCE)]. There have been repeated private meetings between Presidents Heydar Aliyev and Robert Kocharian. I am not privy to all the details but think it is safe to say that the peace negotiations always stumble over the question of the final status of Karabakh, as well as the status of the occupied territories outside the formal borders of the Autonomous District of Mountainous [Nagorno] Karabakh in Soviet times. Thus my painful question for my Azerbaijani friends. Is there no price to be paid for incompetence in that horrible thing called war? No price for choosing or tolerating the wrong leadership or allies? And if there is no price to be paid, and the situation is supposed to revert to some ideal status-quo-ante and a sort of universal "right of return", what is that status-quo-ante, the ideal "Year Zero"? Is it 1993, before the capture of the eastern provinces [outside of Nagorno Karabakh] and Kalbajar? Is Year Zero the year of 1992, before the capture of Shusha and Lachin? Or is it 1991, before Khojali? How about 1990, before Chaykent and Operation Ring and the, shall we call it, "ethnic adjustments" of Jeranboy/Shaumiyan? Or before January 1990, meaning that the Armenians living in Baku would get to return to their homes? What about 1988, before Sumgayit and the expulsion of the Azerbaijanis from Zangazur? Why not make Year Zero that era before the massacres of 1918, 1915 or maybe even 1905? Why not 1828 and the Treaty of Turkmanchai [which divided Azerbaijan between Russia and Iran into Northern and Southern regions], when Yerevan was still an Azerbaijani or at least a Muslim settlement? When and where is Year Zero? Which date must the two sides return to in order to resolve this problem? I have no answer to this thorny question, but I know it must be asked. And having asked it, I now would like to return to Khojali, leaving the larger, rhetorical and historical questions aside, and to focus for a moment on the victims of that ghastly night of February 25-26th, 1992. The following is a selection of the chapter in my book on the early days of post-Soviet Azerbaijan, and entitled, simply, "Khojali". After that I will be ready to answer your questions.